How to import to Mongolia? 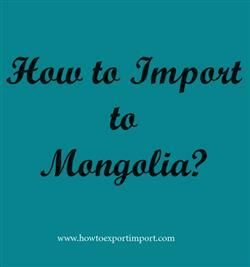 What are the import procedures in Mongolia to move goods? Explain about import registration process, cargo movement to Mongolia from overseas countries, Import delivery process in Mongolia etc. Detail the import methodology in Mongolia. This post explains about step by step procedures that need to be finished with Mongolia government authority for importation to Mongolia. Any Mongolian organization or individual has the privilege to deal with merchandise import and export. Inorder to build a company in Mongolia, it must be registered with the General Authority for State Registration (GASR). A registered trade with concerned license as per the business is must for exporting and importing of commercial products from and into Mongolia. Mongolian Customs, is established with the aim of protecting national security, facilitating international trade, securing national state budget revenue and enhancing the capacity of the customs organization of Mongolia. Understanding the right documents is essential for smooth import and export procedures. The importer should make sure that they made all of the correct import documents that are required to get clear the customs formalities, satisfy all compliance and regulations. The efficiency of the Customs Clearance process is depend on having the valid documents, the accuracy of the information provided in the documents as well as the promptness in submitting the documents and filing the necessary applications for the Customs Clearance. This post explains about different phases in import process that every importer needs to go through in Mongolia. How to import to Ulan Bator? Formalities for import to Ulan Bator. Procedures to import to Ulan Bator. Need to import to Ulan Bator. Explain to import to Ulan Bator. Information to import to Ulan Bator. Step by step process to import to Ulan Bator. Methods to import to Ulan Bator. Guidelines to import to Ulan Bator Please guide to import to Ulan Bator.